Get ready for Spring and Easter with our Peep show! 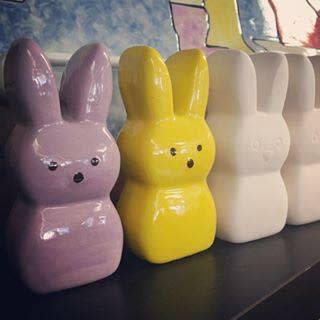 Paint Spring & Peep themed pottery pieces while enjoying some yummy treats. We will have lots of fun templates to make it easy for you to get creative with your design. We will have 8- packs of peeps for $50 special. There will be 5 different stations with techniques to decorate your peeps also! Since this is a special event with limited seating, we are requiring advance reservations with a $10 non-refundable deposit. The $10 deposit will be subtracted from your balance that is due that evening.